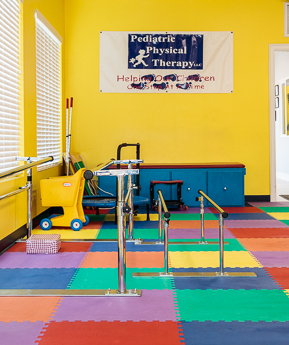 Intensive Pediatric Physical Therapy is scheduled 3 hours a day, 5 days a week for 3 weeks. This intensive level of therapeutic treatment allows enough motor practice for new motor patterns to become more automatic. Equipment includes the universal exercise unit and the TherasuitTM. The universal exercise unit is designed to allow resistive training for even limited motor control through a system of pulleys and support. It also provides partial weight support or resistance as needed during completion of functional activities. The Therasuit™ is a soft dynamic proprioceptive orthotic which allows correction of posture and alignment to as close to normal as possible through a system of elastic rubber bands. How do I get more information about attending an intensive physical therapy session? Call (251) 450-0070 for more information and an enrollment packet. Kanda,T., Pidcock, F.S., Hayakawa, K., Yamori,Y., Shakata,Y. (2004). Stiller,C., Marcoux,B.C., Olsen, R.E. (2003). 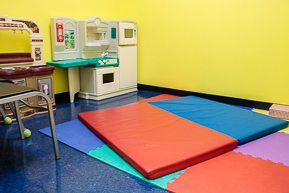 The effect of conductive education, intensive therapy, and special education services on motor skills in children with cerebral palsy. Physical and Occupational Therapy In Pediatrics, 23(3), 31-50. Odman, P. and Oberg, B. (2005). Effectiveness of intensive training for children with cerebral palsy –a comparison between child and youth rehabilitation and conductive education. Journal of Rehabilitation Medicine, 37(4), 263-270. Intermittent intensive physiotherapy in children with cerebral palsy: a pilot study. Developmental Medicine and Child Neurology, 44(4), 233-239. Shumway-Cook, A., Hutchinson , S., Kartin, D., Price, R., and Woollacott, M. (2003). Effect of balance training on recovery of stability in children with cerebral palsy. Developmental Medicine and Child Neurology, 45(9), 591-602. Damiano, D.L. and Abel, M.F. (1998). Functional outcomes of strength training in spastic cerebral palsy. Archives of Physical Medicine and Rehabilitation, 79(2), 119-125. Morton, J.F., Brownlee, M. and McFadyen, A.K. (2005). The effects of progressive resistive training for children with cerebral palsy. Clinical Rehabilitation, 19(3), 283-289. The Therasuit™ and Therasuit Method™ were developed by Richard and Isabella Koscielny in Keego Harbor Michigan . They own Therasuit, LLC and The Pediatric Fitness Center, LLC.